I finally have done it! I have posted an exhibition before the event. Studio 20/17 has been kind enough to host my Maser of Fine Art graduating work. This is my first real solo exhibition since the late 1980's. That's right, since the 1980's. Back then it was my graduation from the University of Tasmania. It wasn't called that then, but I can't remember what it was. I had just married Nick, who helped so much to set up that show, as well as setting up this one. He made the stands for that show, too, though then they were covered in glass, painted black and lined with green fabric. Thank you Nick. I wish that we had taken photos but it didn't happen - no camera. Not only did I have his help but I also had the help of lots of friends - one will be helping with this show also (thank you Matt). Last time his band played at the opening, this time he will be bumping out. Nick's brother, Brendan Hackett, who came over to Tasmania to help set up, has helped to paint the new stands for my work. Thank you Brendan. Some of the other people who helped me with that graduation show are still friends with me today. Others have been busy making their own life, and others have died. I miss them all even now. Something warm, my child, something warm. Something from long ago, me lad, something from long ago. Something that makes you cry, my boy, something that makes you cry. Something that makes you laugh, my darling, something that makes you laugh. 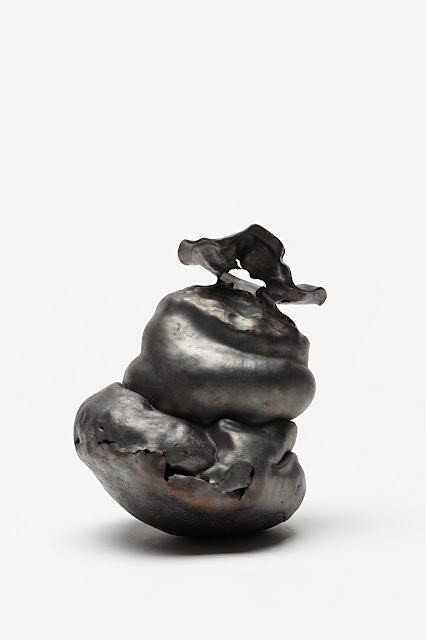 Conduit is an exhibition of work by metalsmith Mary Hackett that explores the relationship between hand, metal, motion and form. These pieces are about the hand. The hand that made them, the hand that will hold them, and memory of the hand in its absence. Hackett is interested in how the hand remembers objects that it has previously held, not only the physical and common act of grasping, holding, or touching an object, but the associated memories that accompany such an action. 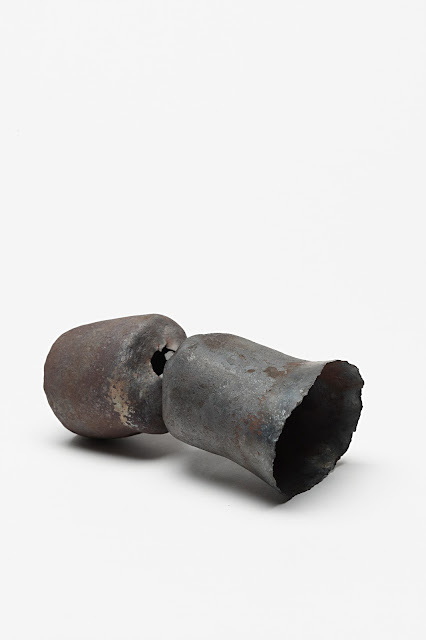 It is the process of making that Hackett is fascinated by, how the hammer, as an extension of the hand, can stretch and compress the metal, how far can she push until it has reached or gone beyond its limit? There is no backward step in her process, just a continuing on, a pushing forward and she readily admits that it is the hand, not the eye that knows when an object is ready. Blacksmithing is by no means a quiet, clean or gentle pursuit, on the contrary it is steeped in male tradition and history and it requires much force, technique, and physical exertion to succeed. It seems almost incongruous that these modest objects have been created with such force; perhaps this is why the marks of making have not been erased, to remind us how and why these objects came to exist. Each piece is a whole, with no joins or additions, raised or forged from the one piece of metal. 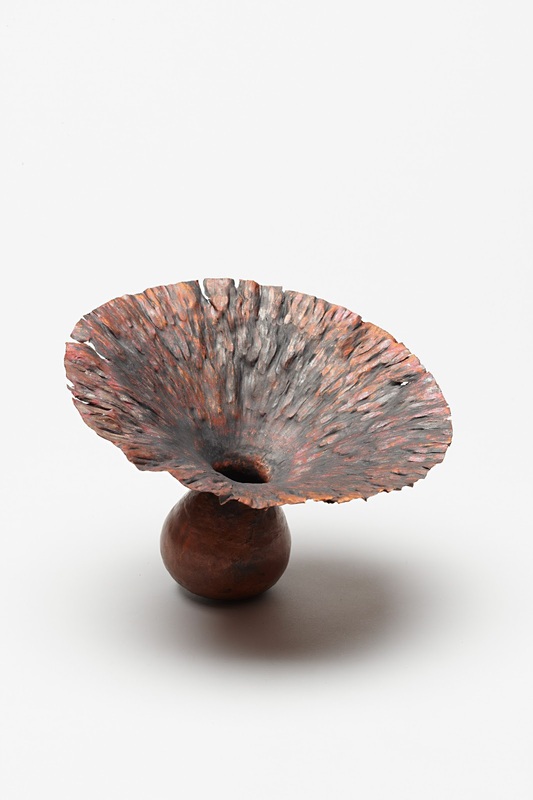 Each copper and steel piece originates from the same source, a pipe. A conduit. Not only then is the exhibition title particularly apt for this reason, but a nod to the conveying of hand and memory into motion and form. They sit on plinths up high, allowing you to investigate from all angles and the milky white surface they occupy reflects back another ethereal side of the object. They are placed in the space in such a way that they speak to one another, relating memories and forms back, forth and around each other. These pieces invite you to touch, to hold and cradle them, to pick them up and grasp them. They ask you to wonder how they would sit in your hand, question if would you hold them close or at arms length. Are they heavy or light? Are they cold to the touch? Do they warm quickly? What is it they remind you of? 1 Fox, M. ‘Wilfrid Gordon McDonald Partridge’, Omnibus Books, South Australia, 2012. Hurrah! Congratulations Mary. Hope the install goes smoothly and that the opening is a blast. I am constantly confused about my reasons for loving metalsmithing and, as a consequence, I spend a lot of my time asking myself why. Recently I completed a Master of Fine Art at the Royal Melbourne Institution of Technology, Melbourne. Now, I co-ordinate a women's blacksmithing group called Blacksmith Doris which I am a founding member; and I teach silversmithing at the Northern Melbourne Institute of TAFE.